I’ve had a lot of questions about some of my chalkboard inspired headers. (This post contains some affiliate links for your convenience. You can read my full disclosure policy here). I actually created this one in Photoshop, but since quite a few of you use PicMonkey, I thought I’d show you how to do something similar in the PicMonkey program. Once Picnik closed its doors it seems to be the program that a lot of bloggers gravitated to. What you need to start off with is an image that looks like a blackboard. You can download a free blackboard background image at Foolish Fire or you can google “free blackboard digital paper” and find quite a few to download for free. Free is good. These come as jpeg files just like your normal photos do, so you are just basically writing text on top of your chalkboard image just like you can write text on top of a photo. Just remember where you save the jpeg. Go to Picmonkey.com and click on Edit A Photo. A box will pop up with your computer files on it, so just pick the chalkboard image that you had saved previously. When your chalkboard image is showing in PicMonkey, you need to click on the Tt icon on the left which signifies Text. It will give you different font styles that you can pick from. In this instance, I used Lobster Two for the word PicMonkey. I picked a white color for my type. I changed the fade from 0% to 8%, just to lighten the harshness of the text. Chalk isn’t super duper bright on a chalkboard. Below that I typed the words Chalkboard Art in the font Eraser Dust. And the word Tutorial in the font Quentin Caps. Then on to the fun stuff. To add festive shapes to the chalkboard, you click on the butterfly icon which signifies Overlays. There are lots of shapes to choose from, but in this instance I chose the hand which for some strange reason is under the Postal category of the Overlays. I guess people used to write letters. People have hands. Hence hands under Postal??? 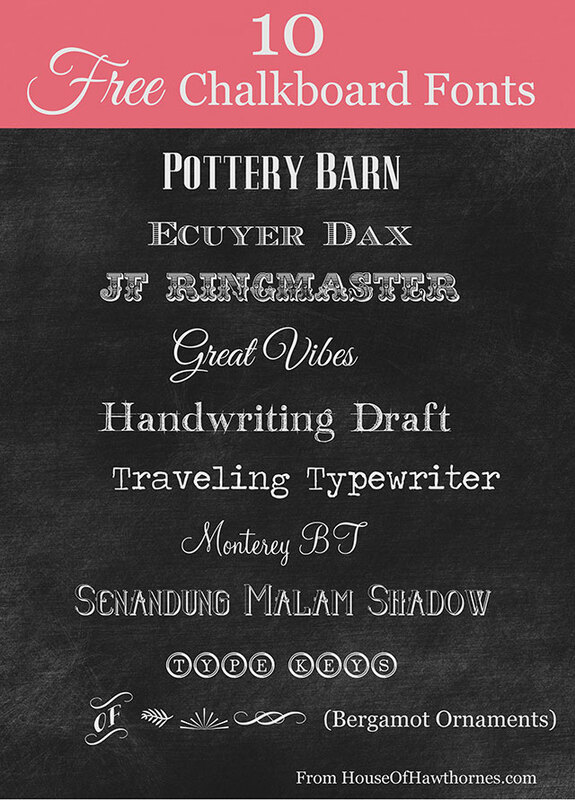 I wanted to put my blog name on the chalkboard, so I chose Ecuyer Dax as the font. And put the word From in the font Learning Curve. I clicked on the boxlike thing on the top of the column that signifies Basic Edits and cropped down my chalkboard to get rid of the excess. and chose to save it in the Pierce size, changed the width to 1000 px wide and then Saved To My Computer. PicMonkey comes loaded with a ton of fun fonts. Or you can download your own fonts to your computer, which then area accessible on PicMonkey. When you are in the Text area (Tt), just click on the brown box that says YOURS, instead of the blue box that says OURS and you will see a list of all the fonts that reside on your computer. Beware – font sites are addictive. You will soon be redesigning your Coke can’s logo in your sleep. Oh, and dingbats!!! Not calling you a dingbat, but there are things called dingbats that I am sort of addicted to. Love them. You will type a letter in a dingbat font and a graphic pops up. For instance the little leaf type thing in my header is a capital letter S in the Bergamot font, which is a dingbat. Sure, PicMonkey has something similar in their Overlay section, but there are some pretty fun dingbats out there on the web and they are pretty much a requirement in authentic chalkboard looks. Gwenn Moss has a nice post about making real live chalkboards, not of the only-on-the-computer-screen variety. And she made a chalkboard with a typewriter on it for her office. Great minds think alike! She has lots of little tips including using hairspray after you’re done. On the chalkboard, not your head, your hair is just fine. I hope you enjoy creating your chalkboards, either on the computer or on an actual blackboard. What a great post, Pam! 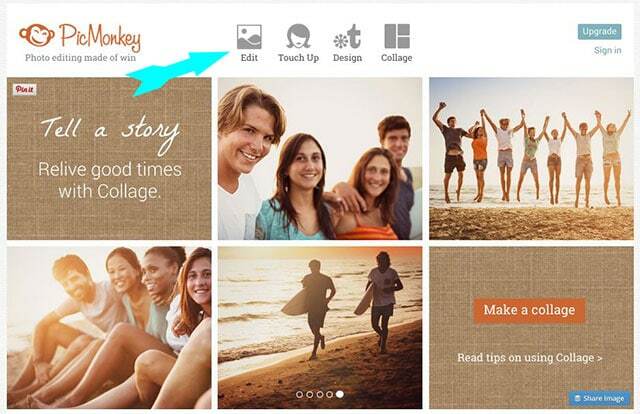 I love Pic Monkey and appreciate all these fun tips! Pinning! I barely have Picassa figured out, I hope I can get the hang of picmonkey. Super cool header, my home photos are so last year! Fun, fun 🙂 I have played a bit in picmonkey…but didn’t know about the chalkboard…can’t wait to try it!! By the way…your blog is looking GREAT!! Thanks for the source for the chalkboard background, Pam! PicMonkey is so user friendly, isn’t it? My photo shop skills are sadly lacking- I need a one on one tutorial. Love this look… your new header is fabulous! What a great post!! My header needs help – I am hoping this post will give the tools I need to make it look better! Thanks you! You aren’t kidding. You could spend hours on these sites playing around with this and that and not even realize how much time has passed. Very dangerous. Great post. Love this!! And you are a peach to put together such a great tutorial. Thanks so much for the inspiration, Pam! Pam, I love your header that you created, and I noticed how your social media buttons match, too! 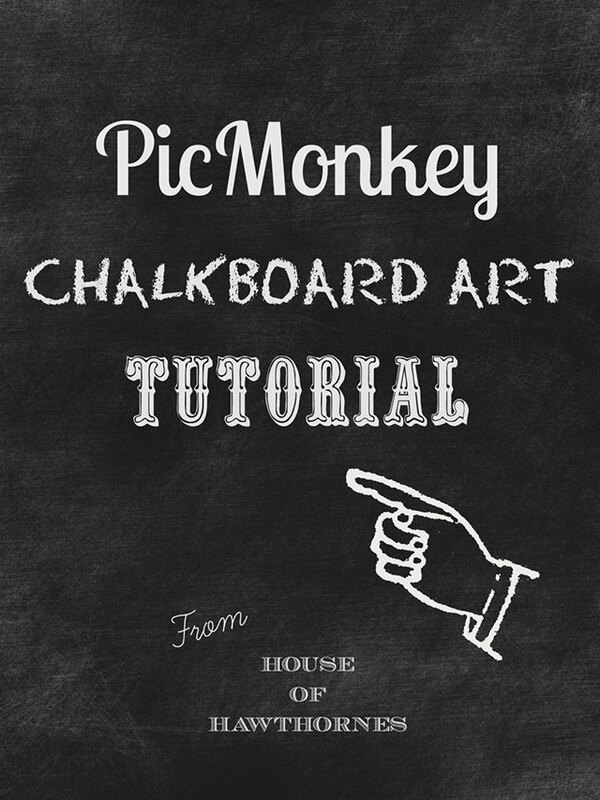 Thanks for sharing how to do the chalkboards in PicMonkey! Great tutorial, Pam. Picmonkey has totally become my favorite “free” photo editing replacement to picnik. All my faculty want to jazz up their online courses with snazzy banners and this is the tool that I sent them too. What a fun post! I love your new header! That is really cool. Thanks for the great tutorial. Girl you did a fantastic job! I love this!! I’ll be keeping this one close by for future fun. I have photoshop but don’t know how to use it. If love to learn how to remove the background from an image! I’d love to know how to remove the background from an image in photoshop. I have it but don’t know how to use it. Hi Pam, in the area where you have listed out the fonts, there is one that looks like it’s titled ‘of’ with little flourishes around the word. Is that the actual name of the font? Seems to be a difficult one to find due to its vague name. thanks for letting me know if that is actually the name of that font. Oh silly me, it’s Bergamot Ornaments of course. Thanks for all the helpful information! Quick question…can you print this once it’s created? If so, what type/color of paper is needed? I’ve seen all these adorable chalkboard signs for 1st Birthdays and I’m eager to try it out for my daughters birthday on the 22nd. Any tips? Thanks so much, this was so much fun to read!!! I’ve resisted the whole chalkboard look craze, largely due to the fact that I had no clue how to do this. Now I blame you for what will surely become my newest obsession. Awesome tutorial, thank you!! Great thanks! Have you printed from picmonkey? I can’t!! Awesome tutorial, thanks! I love the Bergamot Ornaments–had to download them. 🙂 I can’t wait to go make a chalkboard printable!